I looked into his eyes and stepped back into another world, into another person long since forgotten. A lifetime ago, before I went into police work, and then retired to ranching full time, I was a sixth grade Science teacher. For ten years I taught children about life before finally deciding the public education system wasn't for me. I loved the kids, and I loved teaching. What I didn't like was the direction public education was headed. I still firmly believe that standardized testing and teaching a curriculum aimed at merely passing tests is a mistake. This does not lead to a well-rounded education. The education system is losing too many talented teachers and students each year as it doggedly marches down this path. In the mean time, those left are doing the best they can while their hands are tied by an out of touch system. Like tired swimmers they dog paddle along, trying to keep afloat while more and more responsibility is heaped upon the tiny raft they cling to. And bless their hearts, they keep on swimming. It's been such a long time since I've been in the classroom that I'd almost forgotten the best part of teaching, the simple joy of watching a spark of interest ignite in a child's eyes. Away from the standardized tests, and the lesson plans, and the endless series of time segments marked by the ringing of bells and the scuffling of feet and backpacks, the essence of teaching is about lighting fires. In this age of information, where the world is only a tap on the smart phone away, true learning is still no different now than it was forty years ago. An education is not simply a regurgitation of facts, it's an accumulation of life experiences, an awakening of interests, a love of learning, and the knowledge of where to go to find out more. Knowledge is power. The art of bubbling in answers on a scan sheet is not knowledge. It's a skill. It rained so much this week that I didn't bring the sheep to Pioneer Days. When my husband impulsively volunteered me to demonstrate spinning raw wool into yarn, I wasn't too keen on it. 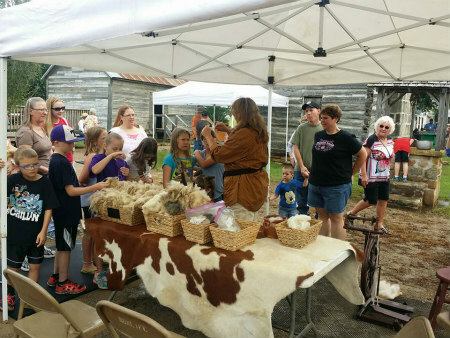 The idea of participating in Pioneer Days may have been fun if I'd had period clothing and the time to prepare, but this was pretty short notice. All I had was muddy sheep, some leather snake boots, an oversized cowboy shirt, and a black belt I made myself from Navajo Churro wool. I also had raw wool in various states of preparation, and my trusty Kromski Sonata spinning wheel. And a distant memory. I remembered what it was like to awaken a spark of interest. I remembered what it was like to blow on that spark to make a flame. And I remembered when to let go, to let that flame take off on its own. And it did. Children still tickle me. None of them woke up that morning with any interest whatsoever in wool or spinning yarn, and frankly my goal wasn't to teach them to be expert spinners, it was to awaken an interest in a dying craft. It was to give them something they can't find on The History Channel, a real tactile experience. Touch it. Smell it. Feel the life of the sheep in your hands. I could have provided a history lesson on spinning. I could have tossed out the neat little factoids that interest me so much. For instance, did you know where the term "spinster" came from? In Colonial America spinning was serious stuff. Wool was big business in England and the Colonies. 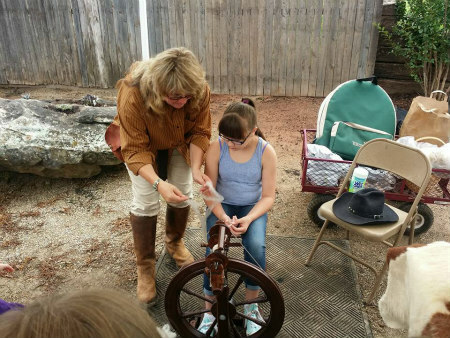 Massachusetts even passed a law requiring each family to spin a pound of yarn a week for thirty weeks. They were charged money for every pound the family fell short. Because of this many families brought in unmarried relatives or friends to help spin wool. This is where we got the term "spinster. But I digress. Kids don't care about taxes. Kids want to touch things. They want to hear that spinning yarn is a skill they can master, like dribbling a basketball. They want to pick things up, and smell them, and feel the grease on their fingers. 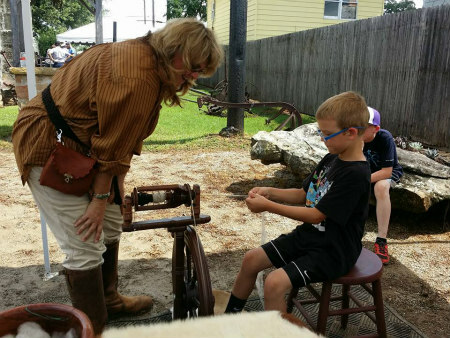 They want to sit on the stool, touch the magic fiber, peddle the treadles, and watch the wheel turn that fluff in their fingers to yarn. And they want to take that yarn home. The yarn will stay in their pocket for the day. It'll be dangled in the faces of family members, and in time, it'll be thrown away, or stuffed in the back of a drawer. Maybe, if it's lucky, it'll be tucked in a cherished place with other childhood treasures. The important thing isn't the yarn, it's the spark of interest in the child. And they were interested. In no time they gathered to spin. The kids took to spinning faster than the adults. There was a line of children waiting for their turn at the wheel. My little Sonata wheel was very forgiving of their efforts. The wool liked the children and in most cases twisted itself into yarn with little or no trouble. As soon as the child on the stool had mastered spinning enough to produce a decent amount of yarn, they yielded their seat and taught the child behind them. Not only was this non-threatening to the next child in line, but it was empowering to the child teaching the new skill. They now shared some ownership. And what we own becomes more important to us. Nothing was stolen. Nothing was broken. The kids were very careful with the wheel. They left with a piece of yarn, some memories, and a fragment of a skill almost lost. And I was richer for the experience too. Some reenactors from another booth came over and asked if I'd do a spinning demonstration at their event next Fall. I agreed, but with some reservations. My wheel is not a period wheel, and I don't have a period outfit, but we can probably work around that. We'll see. On a farm it's easy to shut yourself off, to fall into the routine of caring for animals and thanking God for the sunrise each morning. It's easy to enjoy our blessings and forget that we need to give back to others. This experience reminded me to share those blessings, and to reach out and touch the next generation. The things and skills that are important to us, these things we don't want lost, can only be saved if we share them with others, if we awaken a passion in someone else. As a kid, I would have hung around all day. Learning to spin would have been the height of my year. That was a cool thing you did!